Southeast Asia has a huge collection of rivers where monsoonal rains mean some excellent white water with rapids ranging anywhere from grade one to five. Although there are grade six rapids in parts of Southeast Asia, they are considered unnavigable and far too dangerous. Based on our exploratory first descents we are offering two totally different experiences. 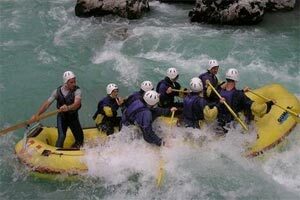 The Mayhka river is the most extreme multi-day river expedition offered on the planet. This is our “Everest of Rivers” and the expedition in 2005 will be the first commercial raft descent through an area which is totally unexplored. Our exclusive three-day wilderness experience on the NamLang river offers a unique and exhilarating insight into this area in style, comfort and safety. The Nam Lang is a phenomenal journey through pristine jungle and seldom visited tribal areas. Suitable for almost all age groups, it combines the thrill of Class 3 and 4 whitewater through thickly forested canyons, with a closer insight into a people and way of life unchanged for centuries. 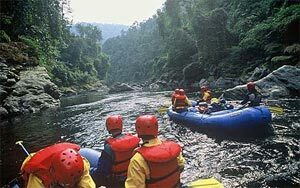 The Maykha River on the mountains of the Kachin State is the best spot for the adventures of a wild rafting experience. The river is also well known for its scenic beauty. In the far north of Myanmar, on the borders of Tibet and Northern India, lies one of the last great wilderness areas in the world. Here in the eastern reaches of the Himalayas, the mighty Ayeyarwaddy River is born, before it begins its epic journey southwards to Mandalay and out into the Bay of Bengal. It has only recently become possible to get permission to visit many areas of this little known destination. Ultimate Descents offers exclusive rafting and trekking journeys into this tribal land of dense forests and snow-capped mountains. Few people associate glaciated mountain peaks, deep gorges and unexplored rivers with Myanmar, which is thankfully one of the reasons so few modern day adventurers have travelled here. With little in the way of roads or development the Northern Myanmar ecosystem remains phenomenally intact and is internationally recognized as a hotspot of biodiversity. Climax old growth forest is common, supporting a huge range of animal and bird life while in the high alpine meadows many of Asia’s rarest flowers thrive. This is a place of pristine beauty, exotic cultures and some of the most radical topography on earth. Travelling in Kachin State is full of simple delights and opportunities that cannot now be found elsewhere, providing timeless and unpretentious experiences. It’s a great place to escape to. We also operate a variety of treks into the Kachin tribal country along the borders of India, Myanmar and Tibet. Our trekking routes take us along ancient hunting and trading paths through dense tropical jungle with longer treks rising into alpine forests and meadows to the glaciated peaks. While trekking we chose to camp in spectacular wilderness settings, and during the day we pass through different ethnic tribal villages. Using local guides and porters from these areas enables heart warming cultural interaction which is a big part of what makes trekking in these isolated areas so special.